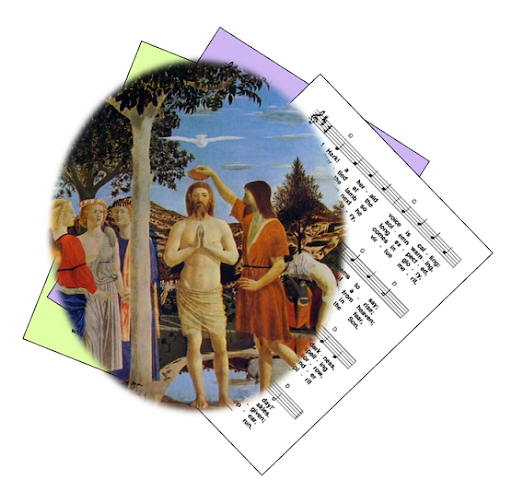 A selection of free-to-use (ie public domain or copyright-free) hymns and song suggestions, based on themes from the Roman Catholic lectionary for the feast of the Baptism of the Lord / 1st Sunday of Ordinary Time, Year A. First: Isaiah - The Lord says "Here is my servant ... that he may bring true justice to the nations ... he does not cry our shout aloud ... Faithfully he brings true justice .. I the Lord have called you to serve the cause of right ..."
Psalm 28 : The Lord will bless his people with peace / O give the Lord you sons of God / The Lord's voice resounding on the water / The God of glory thunders. Second: Acts : God does not have favourites: his word was sent to the people of Israel - but Jesus Christ is the Lord of all ... because God was with him, Jesus went about doing good and curing all who had fallen to the power of the devil. Gospel: Matthew - John baptizes Jesus - the heaven opened and he saw the Spirit of God descend on him like a dove ... "this is my Son, the beloved: my favour rests on him". Mary - mother of Jesus and Mother of God. God's blessing. Peace.